Sometimes you stumble across a portfolio where the artist only has a couple of comic based pieces, other times there can be just one work so brilliant, you'd risk being stoned to death by fellow art lovers for putting something else beside it. These are Random Works of Wow, and illustrating the point this week is artist Pobre Turretrato with The X-Men that relaunched the franchise the first time around. A homage to iconic X-Men artist Dave Cockrum, this piece showcases not only why this team is one of comics' greatest line-ups, but also why it was more entitled to claim the name 'Earth's Mightiest' then the globally themed but often all-American Avengers that often do. What do you think? After you've clicked to really, really enlarge, sound off below or to view more of Turretrato's awe-inspiring work, click the jump. As I've said in the past with previous spotlights of future artists, I can't believe no one's commented on how talented this guy is! I love the old-school X-men, and the Dave Cockrum homage here is truly note-worthy. I'm taking this picture and using it as my new background now. Hopefully we can get pobre to illustrate the satellite-era JLA maybe? You know what Dale, you're right again - it does make an awesome wallpaper! I dig how Nightcrawler's tail wraps around Wolverine, kinda symbolising they are the team within the team. If Pobre could do a string of line-up based images, I'd have to also see if I could get The New Teen Titans in thereaswell. Just because. Indeed, let's make it happen. 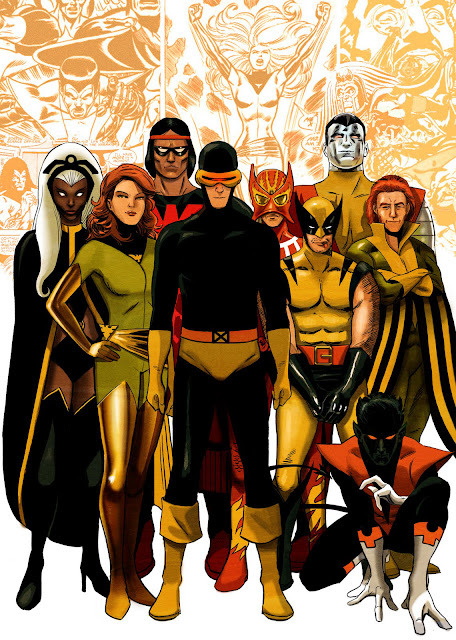 And no offense to other X-Men line-ups, especially the Gold and Blue teams I grew up on in the early 90's, but this line-up right here is what should've always existed, even into today's time. Of course magneto, Psylocke, Rogue, gambit, Namor, and Emma would have to be fit in, but this to me, is the true quintessential X-Men. This was the X-men I grew up with, just throw in Colossus and Kitty Pryde as the junior members. I loved this team. Glad you like it too Robert - looks like this one's a sure fire hit! Me, while still don't see Namor as an X-Man,, I can see the ol' winged ankles here nicely. I think I'd resist adding him or my guy Beast to this line-up (just), if I could plonk in the Scarlet Witch. As a reader I just always thought Charles would want Wanda in the mix at some point, and she has the classic feel that would suit this team too. I always had trouble putting Namor on a hero team because he was always fighting the FF in my earliest memories and was so jerky about it. And when I first read Wanda she was an Avenger. So she's firmly ensconced there for me. But I see how she could fit in on the X squad. For me there is no completeness of the X-Men anymore without Kitty. She was brilliant, her power had more potential than anyone ever gave her credit for, and she was significantly more well adjusted than the rest of the fruitcakes despite the crap she went through. Plus, Wolvie loved her. Nightcrawler loved her. Storm loved her. Everyone loved Kitty. Heck, even Emma wanted Kitty. She was a true X-Man. Brave, valiant, and honest. I miss my Kitty. I agree Random. The only teams I can see Namor on are The Invaders, because he just rocks in that setting, and a properly written Defenders book - because it is designed as a team book of people who don't really slot into team book conformity. Namor's just to headstrong to tow a corporate line for long, plus training rookies I think would frustrate him too much. Shadowcat is definitely a star player, and I think that's why the latest batch of x-characters has failed to produce a teen standout like her, Rouge or even Jubilee. Those three were brought in among the core X-group, so you had to become invested in them. These days with the core players stretched so thinly, all new books of teen mutants just appear and you're expected to care to the same degree? It just doesn't add up.